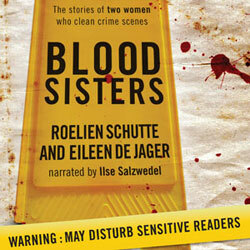 Pieced together from interviews with sisters Eileen de Jager and Roelien Schutte by journalist Ilse Salzwedel, this book offers an intriguing, entertaining and sometimes upsetting glimpse into a world few people know exists. Some of you might have seen the 2008 Hollywood movie Sunshine Cleaning with Amy Adams and Emily Blunt as two sisters teaming up to earn extra cash by cleaning up scenes of murder, suicide and other grisly affairs. This book is nothing like the movie. Eileen de Jager and Roelien Schutte are not squeamish Hollywood princesses who solve familial issues while doing something offbeat together. They are strong, no-nonsense, real women who get on with job and are the best at what they do. As readers, we're taken on an incredible journey that touches on their respective life stories and also the story of their business (now the leading crime cleanup company in South Africa). Along the way we're given a glimpse into crime scenes and what it reveals about the psychology of the people involved. For example, the facts that suicide is seasonal and that women leave “neater” scenes to clean up. It then turns truly upsetting as family murders and farm murders are discussed. The latter especially, called 'torture scenes' by the sisters, lays bare the stark ugly truth behind this hate-driven crime. I am by no means a 'sensitive reader' but some of the scenes and crimes described shocked me to the core. It is human nature at its worst and one can't help but immediately think of your own loved ones and the pain the victims' families and friends must have experienced. And that is why I am in absolute awe of the amazing women who do this type of work. Sure Eileen and Roelien do what they do because it needs to be done, but what is striking throughout is the book is their commitment to make things better for those left behind, the compassion and empathy they display in dealing with crime scenes, and ultimately their steely resolve that inspires those left behind to carry on with their lives.